Towards the end of 2011, two new kits, Cobalt and Clementine, were released for 2012. This time I really couldn’t decide. I loved them both, so I bought both of them. This time the system had changed a bit and different products had started to be added to the range. 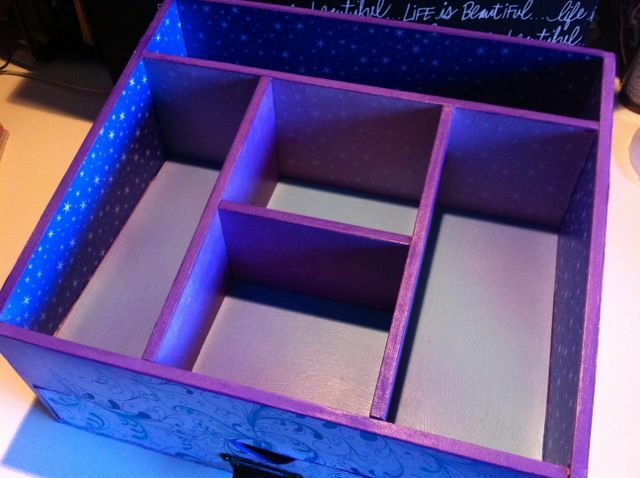 Instead of a kit containing an album, pocket protectors, 12 x 12 papers and the cards and stickers, you got the cards alone in a bigger box and you could buy the albums, pocket protectors and papers separately. 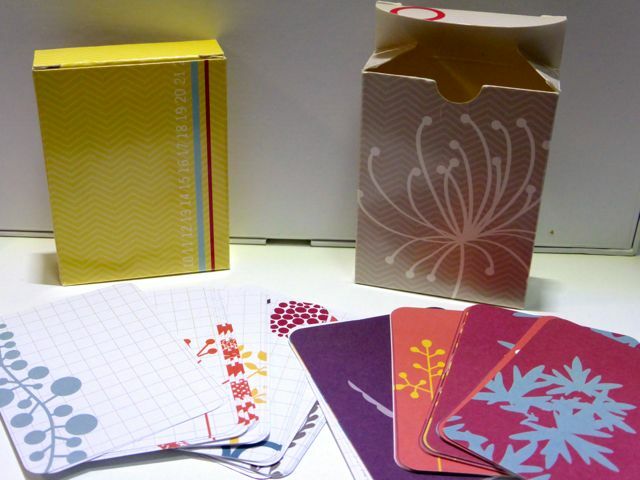 There were more designs of pocket protectors, which were available in mixed design packs of 60 or single design packs of 12 (or 60 packs of Design A, the most common design). The 3×4 journal cards had ruled lines on the back rather than being blank, so you could use the reverse side as well if you wanted a plainer looking card (or you could embellish it yourself). 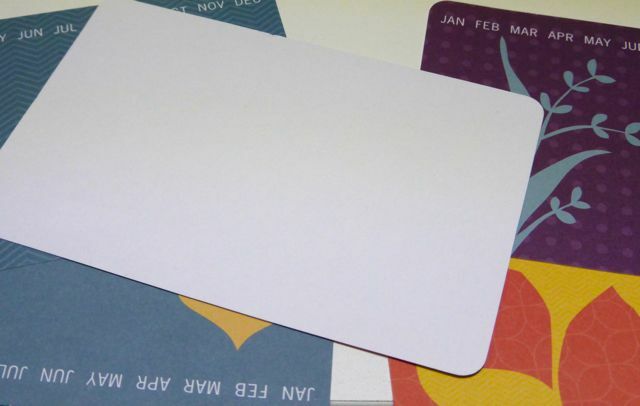 The digital products began to become available too, and while there were no specific horizontal journal cards in the kits, Becky made some horizontally designed cards available for free digitally for the two new kits, so you could print your own. 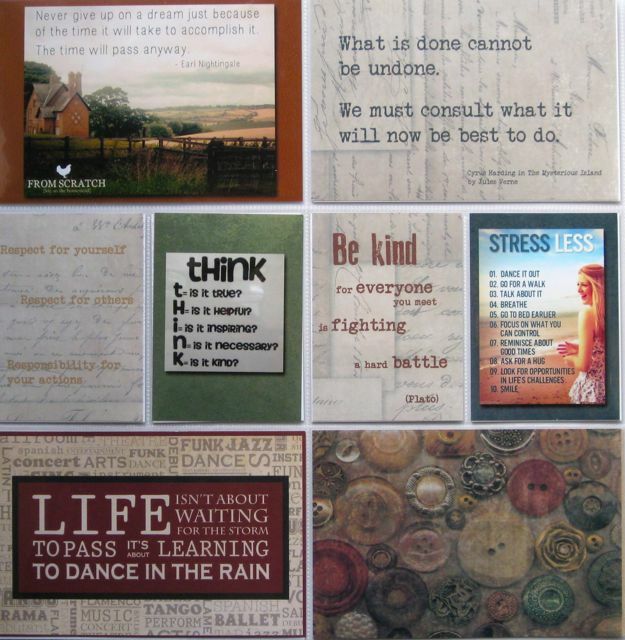 She also released packs of blank grid cards so you could design your own cards if you wanted to, and the backs of the journal cards were also printed with the grid design. In 2012 I worked with the Cobalt kit. I bought the digital kit as well as the physical kit, which, along with the different designs of pocket protectors, gave me a lot more flexibility, while still retaining the simplicity of the original system. 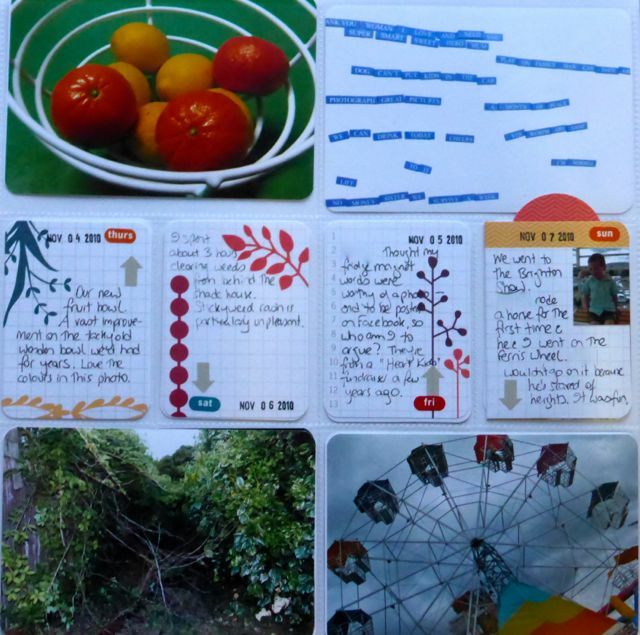 I started to move into the hybrid arena, putting my own photos and journaling onto the digital cards instead of writing on them or sticking smaller photos on. After that release, the new kits started to be released more often, and the products became a lot more easily available throughout the year rather than being a (mostly) once-a-year thing. The format of the kits changed again, with the cards being presented in the flat tray we get today. 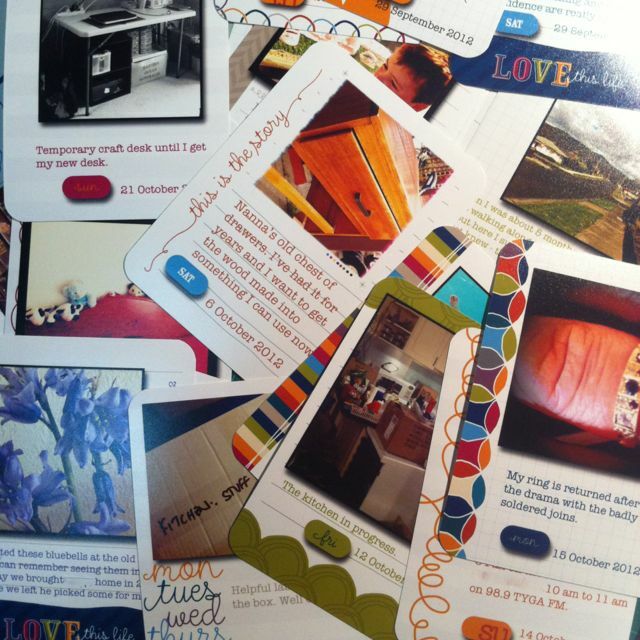 All the cards were printed double sided. 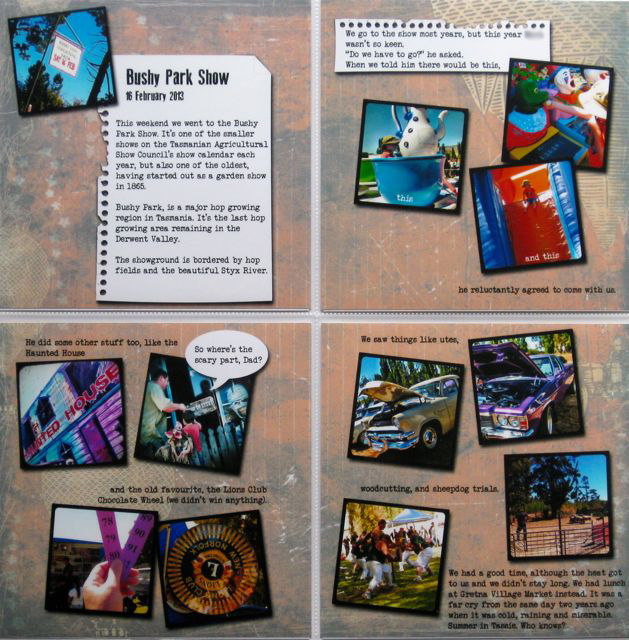 The 6×4 title cards had the vertical version of the horizontal design on the reverse, and the filler card designs were printed on the reverse of the 3×4 journal cards instead of being separate cards. 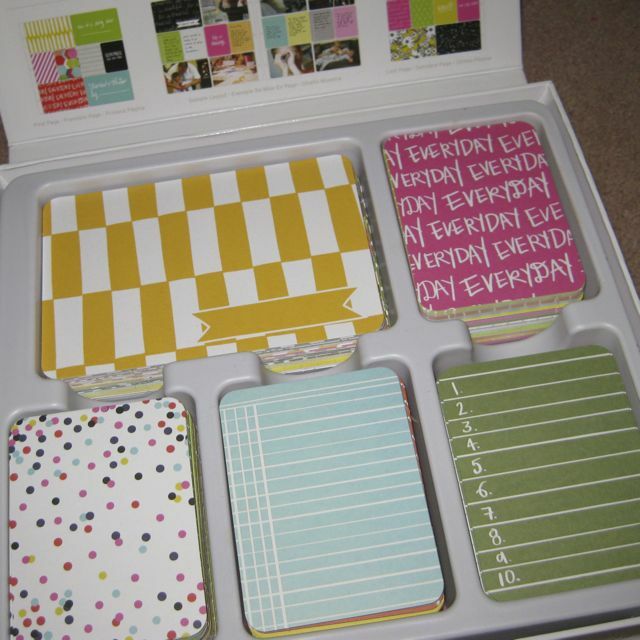 There were new mini kits with 100 cards and other accessories like 6×4 and 3×4 cardstock packs that coordinated with the colours in the kits. Since then the range has exploded and there’s so much to choose from, with new kit designs and products being released all the time. 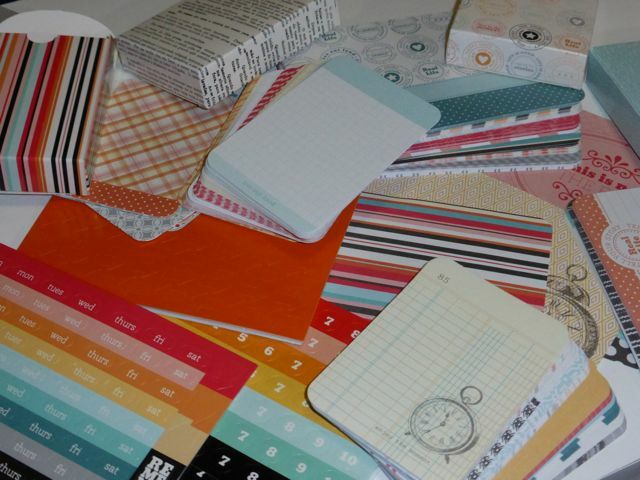 There’s now something like 26 pocket protector designs, mini kits, themed cards, value packs, photo overlays, dies, washi tape, smaller (6×8) albums and pocket protectors, and I’ve lost count of the number of kits that are available. 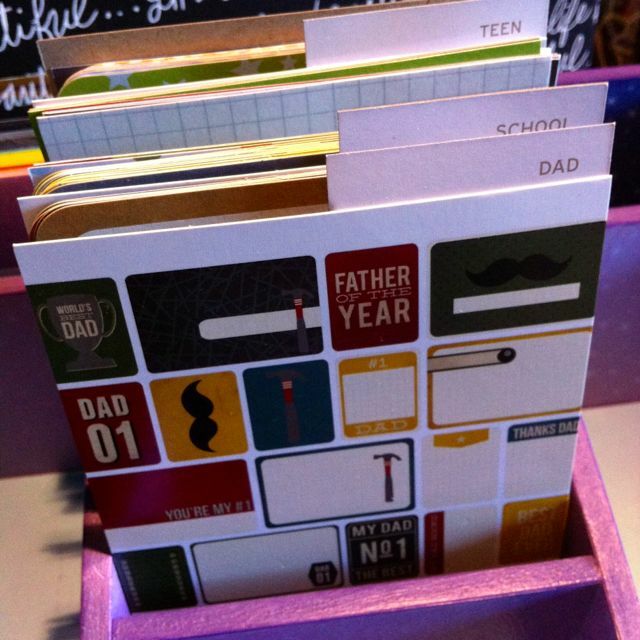 From buying one kit a year and using it for the whole year, people are now mixing and matching multiple kits, creating their own cards, embellishing their layouts similar to traditional scrapbooking, and other companies are also producing their own versions of the system. There are monthly subscription packs and many many types of kits. Project Life has become huge! I can imagine if someone was starting out now, rather than in 2010 or 2011 when there were very few options, it all might look rather intimidating. 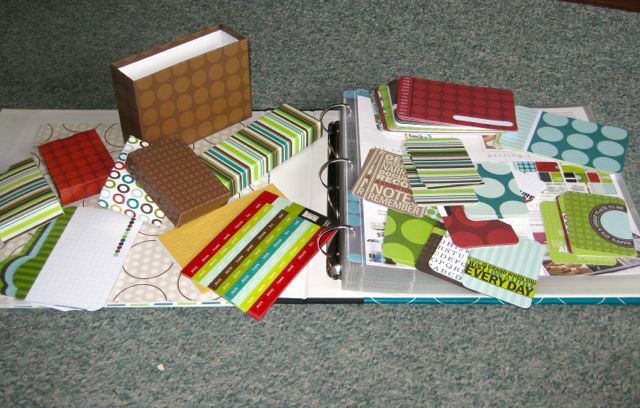 Project Life was never supposed to be overwhelming, but the quantity of products available now (which is all fabulous and allows people to make albums exactly the way they want to) means that starting to work with the system, if you don’t know much about it, can get confusing. It can also mean that you can spend a lot of time on designing your layouts, rather than just getting it all done quickly and simply. I know there are people who love doing this, and love making more complicated pages with embellishments, which works for them just fine. This isn’t how I choose do it. I know that even as an experienced Project Lifer, I can get stuck deciding what to do for a layout because I have too many choices (and too many photos). 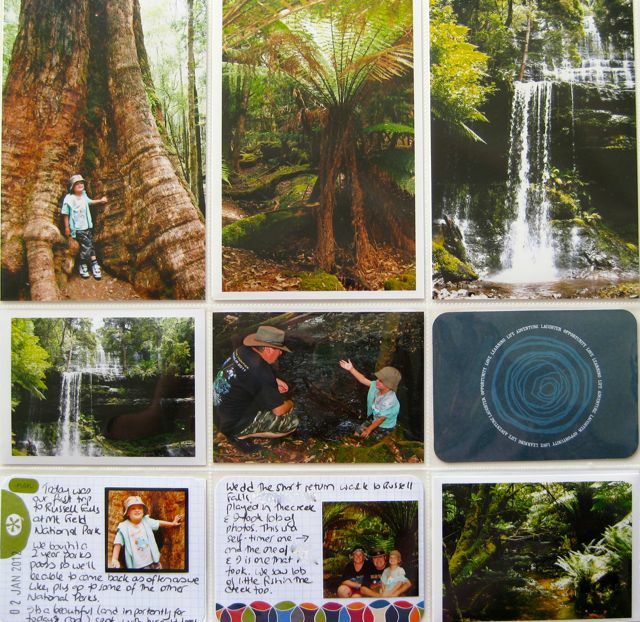 Which cards to use, which pocket protector to use, what size photos to print, what else to add, whether to do it digital or physical. I’ve been trying to catch up on last year’s album and it’s been a very slow process. The original intent of Project Life was to make keeping your memories a quick and easy process, which is what drew me to it in the first place. I don’t mind that there’s a huge range of stuff out there that suits all the different styles out there, but I have to keep reminding myself that I don’t need it all! Every year I start off with the idea of keeping it simple, and every year I get behind in my photos and end up having a backlog of several weeks because I’ve got stuck. I know there will always be some lag, and I’m not always going to be completely up to date with the album, but I’m still sorting though photos from November (not to mention my trip photos from last year), and I want to get my 2014 album finished! I want to make this a process that is easy and fun and doesn’t need too much thought, so this year is yet another attempt at keeping it simple. To start with, I’m not going to buy any more kits. I have plenty of them, and many more part kits that I’ve got from other people. I’ve decided to go old school and use my unopened Clementine kit from 2012 as my go-to kit this year. The challenge with this kit is that the cards are ever so slightly smaller than the new format kits, so this might annoy my perfectionist mind. I’m going to try and stick with the basic Design A for most of my spreads. I’ll also try and limit the number of photos I use – I love collage photos and I use them a lot, but too many of them on page after page can start to look cluttered. This probably means taking fewer photos. 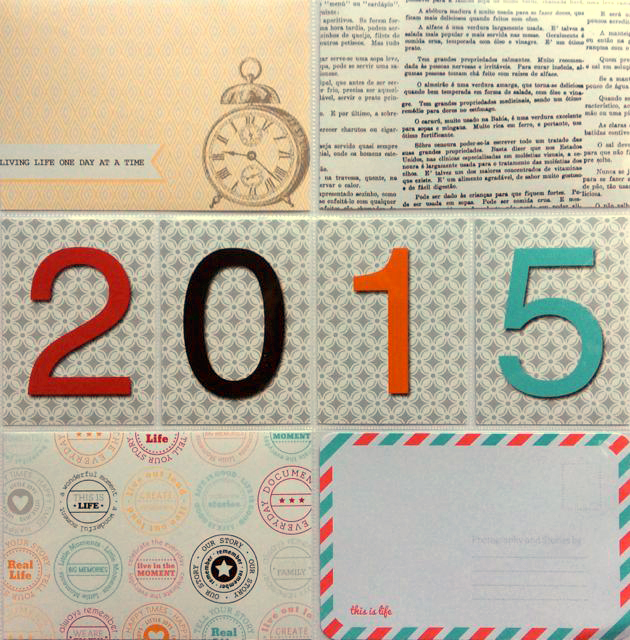 No seriously, I want my 2015 Project Life motto to be “Get it done”, so that’s what I’m going to try to do. What’s your Project Life method? 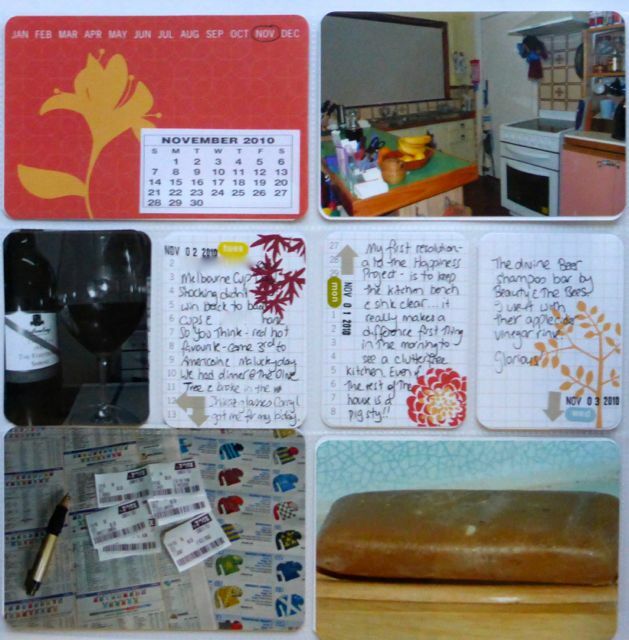 2014 was the 5th year I’d used the Project Life system to document my year in words and pictures. I thought I’d do a review of how the system has changed over this time and how I’m using it. The system has changed a lot since I started back in 2010, but its aim has remained the same: to help people document their lives simply and quickly. To get it done. Most years I’ve chosen one kit that will form the basis of my album, and I always have trouble deciding what that will be. This has become a more difficult decision in the last couple of years because of the huge range of kits and accessories that are available now. 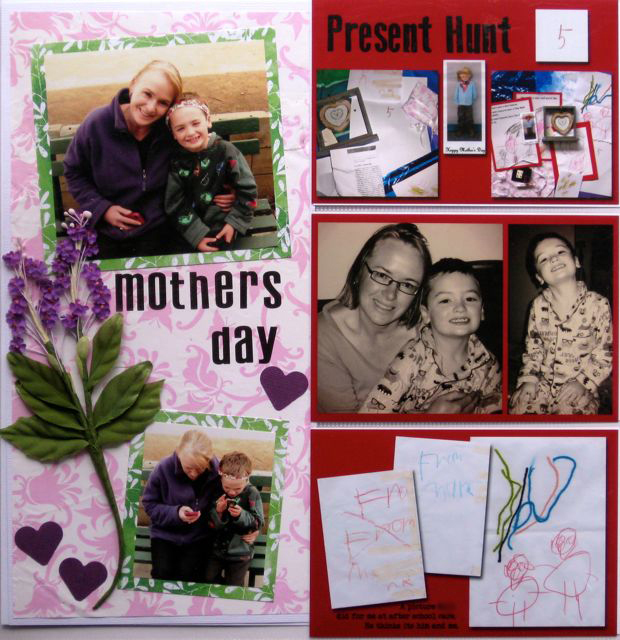 In 2010, the first year of Project Life, there was one kit, one album and one design of photo pages. The only way you could get it from in Australia was to order from Craft House in New Zealand. 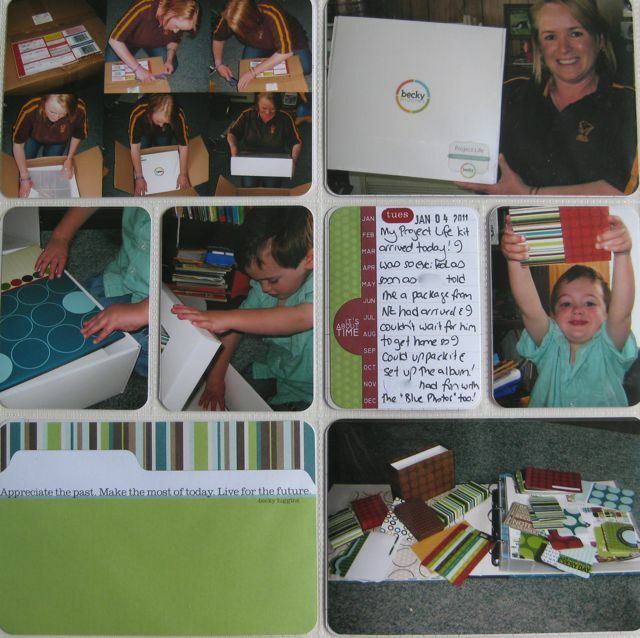 Mary and David Roberts from Craft House put in a huge effort to make sure that Project Life was available to customers in Australia and New Zealand in its first years, and I really appreciate the work they did in getting me hooked on this product and helping me spend all my money! I can remember pre-ordering my kit in 2009. Craft House had been hopeful the kits would arrive in early January, but international shipping and two lots of customs made sure this didn’t happen, and I was hanging out most of January waiting for my kit to arrive. When it finally arrived, I was so excited to see what this system was all about. 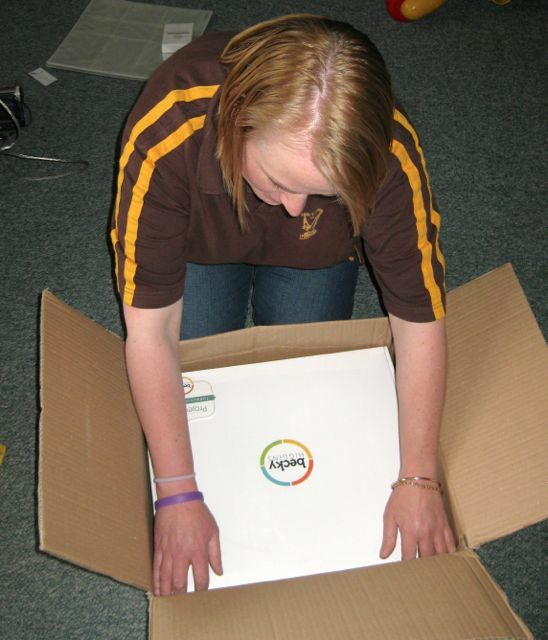 It was a thing back then to take a photo of yourself holding up the box when it arrived and I was no exception to this. The unboxing and setting up the album was fun and also documented in great detail so you could do a layout about your Project Life album. The basic design of the kits was the same as it is now, but it’s interesting to look back on that first kit and see how it has developed since 2010. All the cards came in a little box. 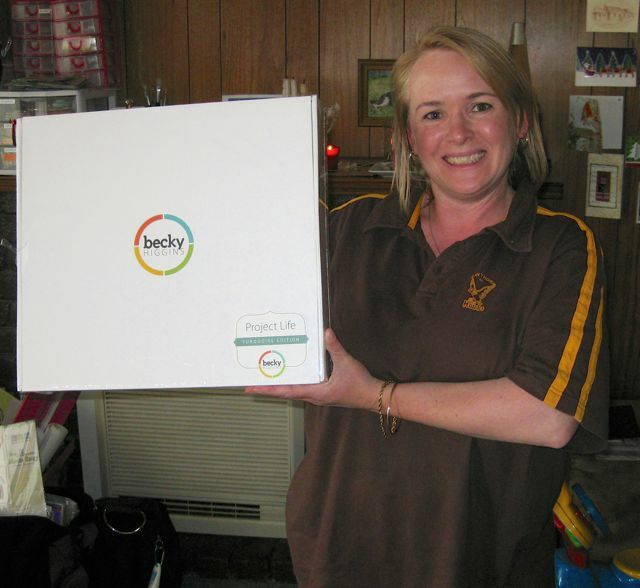 When Becky Higgins came to Hobart last year I took this box in and got her to sign it for me. 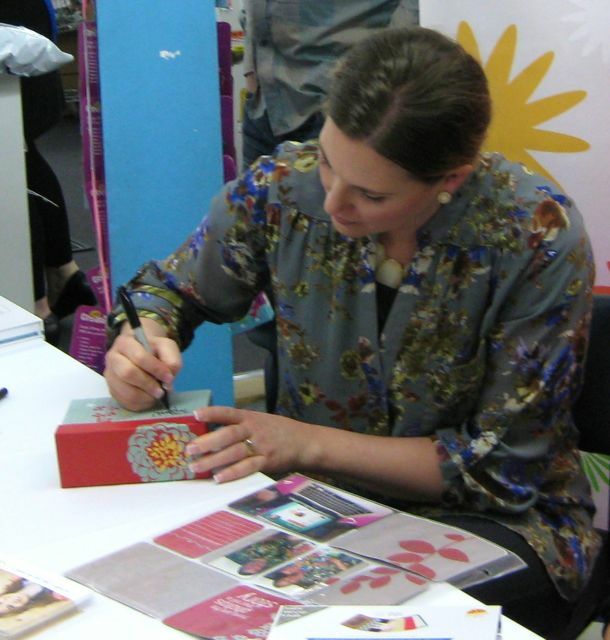 It was cool seeing her reaction to me handing her one of her very first products, and she seemed genuinely quite chuffed that I’d brought it in. But back to the kit . . . The 3×4 journal and filler cards came in little boxes like sets of playing cards. 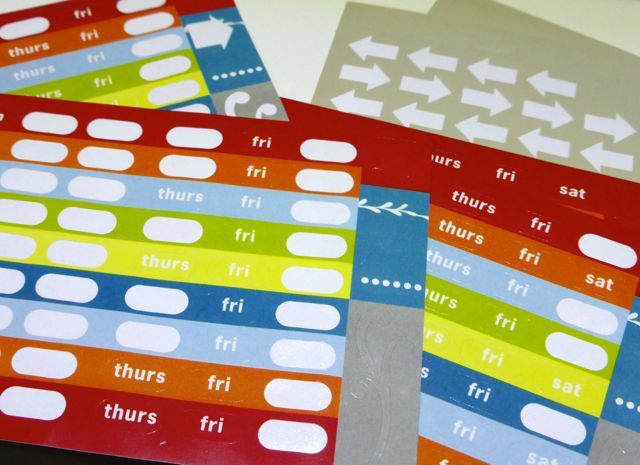 There were day stickers and arrow stickers so you could identify your photos. There was also a date stamp (American format of course!) to date your journal cards. 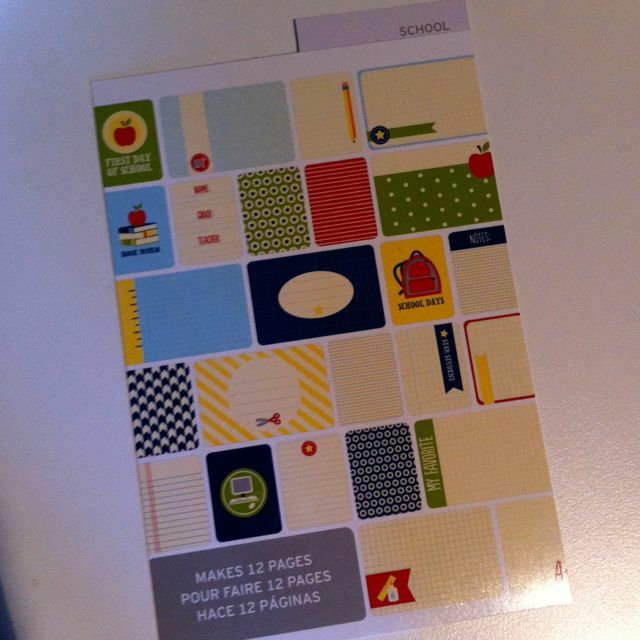 The kits included a matching 12×12 paper pack. 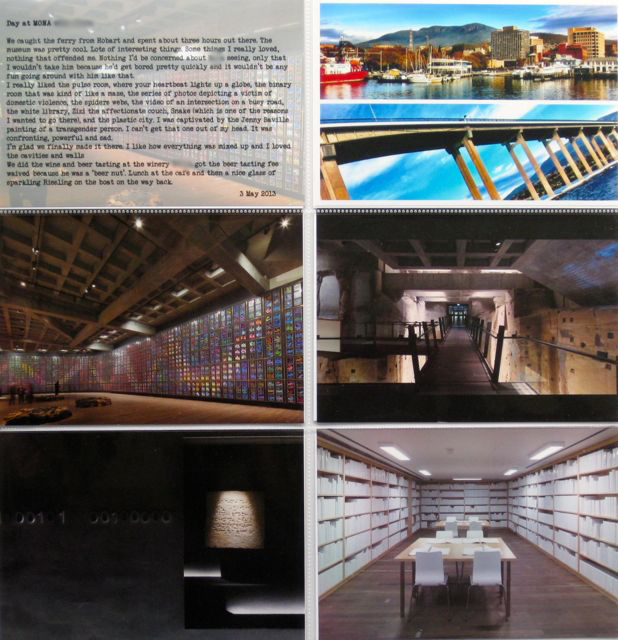 The cards were one-sided, and the 6×4 title cards were all landscape format. 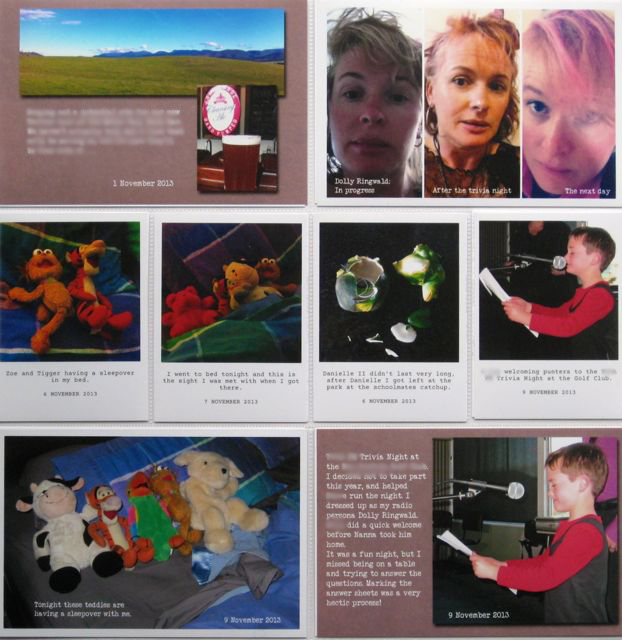 The 3×4 journal and filler cards were portrait oriented. This was fine, because the pocket pages were all what we know now as Design A , with slots for 4 6×4 photos or title cards and 4 3×4 journal or filler cards. 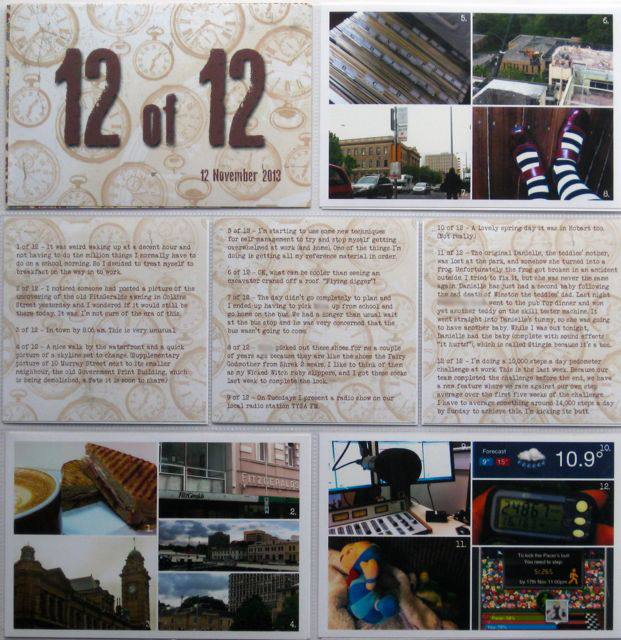 While there was no definitive way to use the album, a popular thing was to use a weekly approach, with a double spread for each week, a title card and a filler card on the left hand page and then the remaining 7 6×4 slots filled with photos and the corresponding 3×4 pocket used for a journal card to describe the photo. 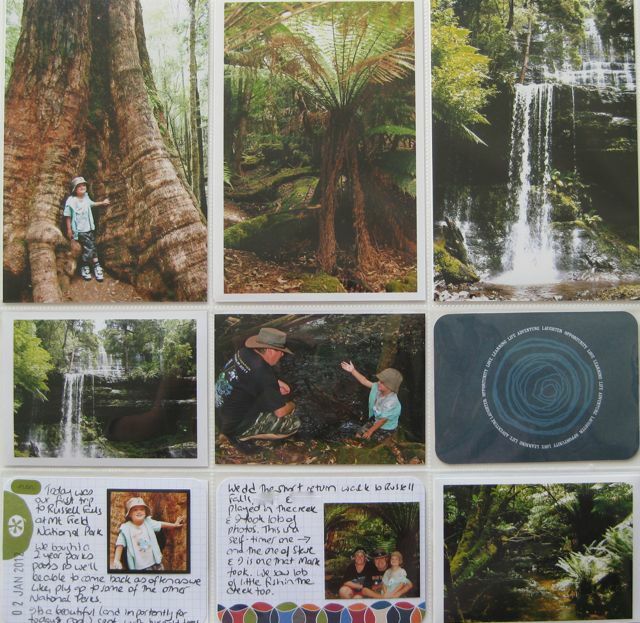 It was ideal for the ‘photo a day’ concept, and there were enough cards and photo pocket pages to do 52 weeks like this. I’ve never been a weekly layout Project Lifer, so I did mine my way, and ended up with quite a few cards left over. 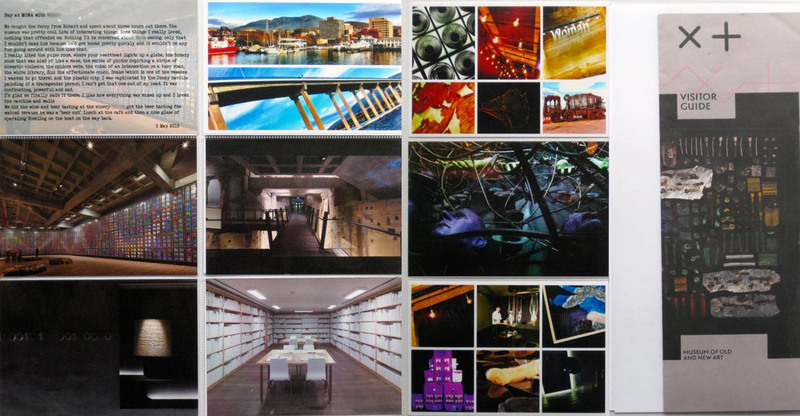 Here’s an example spread (left and right). The original kit was re-released a couple of years ago as the ‘Cherry’ Edition. I think it’s been discontinued now, but the digital version is still available, for free, on the Digital Project Life store. Towards the end of 2010 Becky announced the 2011 release. 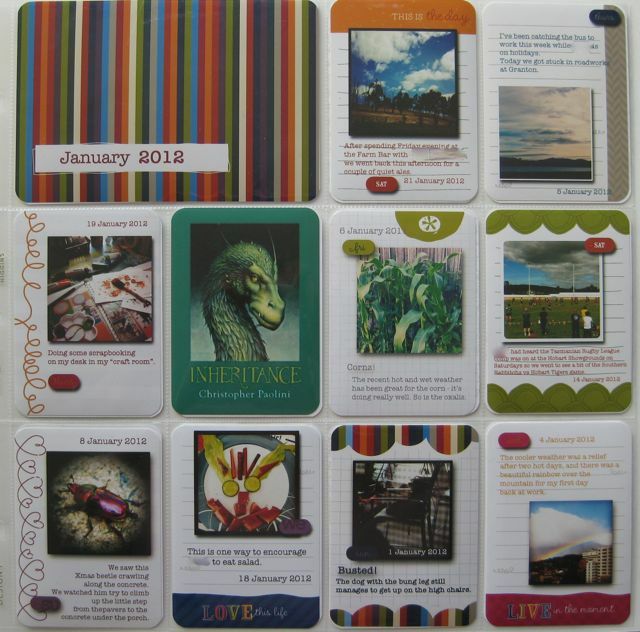 This time there were 2 designs available for 2011 (Turquoise and Amber) and a second pocket page design (Design B), which had space for vertical 6×4 photos and horizontal journaling cards or photos. 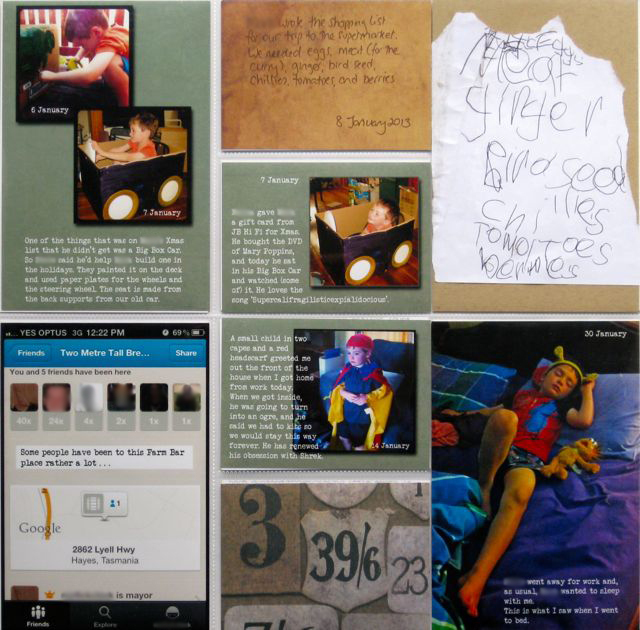 Some of the 3×4 cards were designed so they could be used either horizontally or vertically. I have a love-hate relationship with Design B. 3 photos and 6 card slots always seemed awkward to me and I have often struggled to fill the second 3×4 slot underneath a photo. Sometimes though, it works beautifully. My problems with it has now been addressed by Design D, which is Design A oriented the other way, so has one 3×4 card slot per photo. Ordering for the 2011 kit worked the same as before: you pre-ordered and hoped it arrived before January. I spent a lot of time deciding which kit to buy. (You can imagine if it was this difficult for me to decide between 2 kits, how hard it is now with more than 20 kits available. Maybe more than 30. I’ve lost count!) There were only limited opportunities to get kits outside the pre-order system. I finally chose Turquoise. 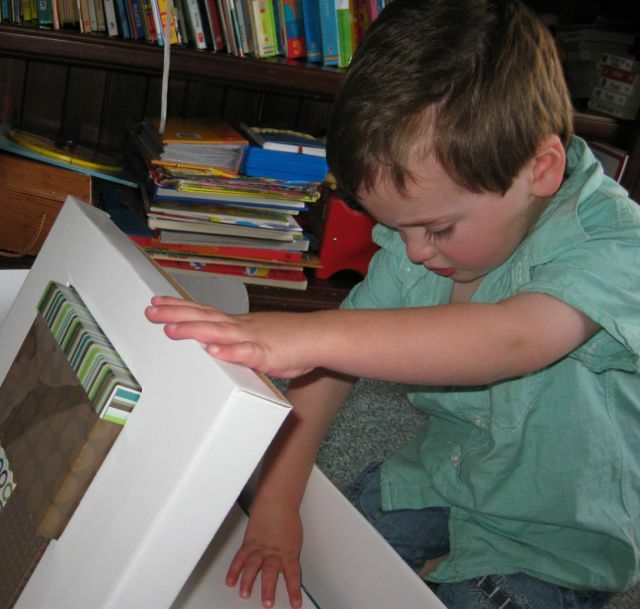 The format of the 2011 kits was the same as in 2010, and this time I documented the unboxing. And did a layout about it. As you do. So that’s my first two years of Project Life. Next post I’ll look at how the kits started to change in the 2012 release. 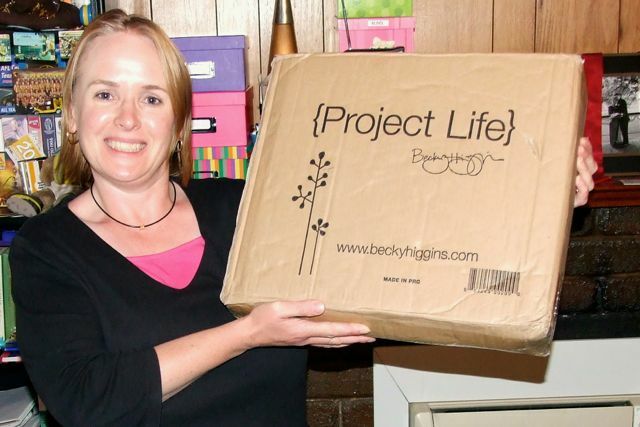 Do you use Project Life? How long have you been using it for? Do you remember the very early kits? I finally decided to give it a go after seeing Annette’s post (which I’ve reblogged here). 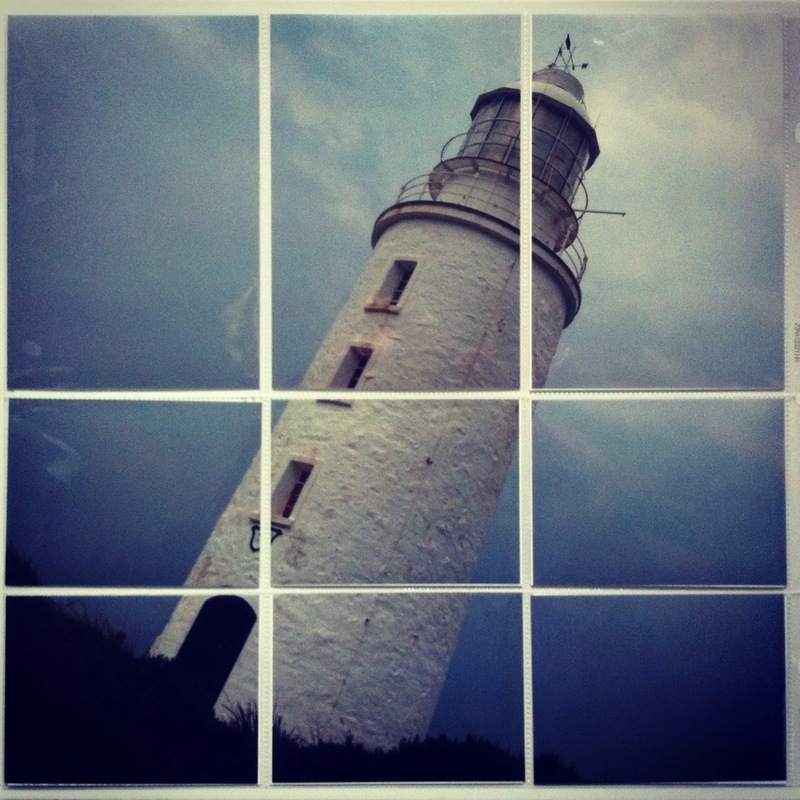 It’s a photo of the Cape Bruny Lighthouse from our trip to Bruny Island earlier this year. 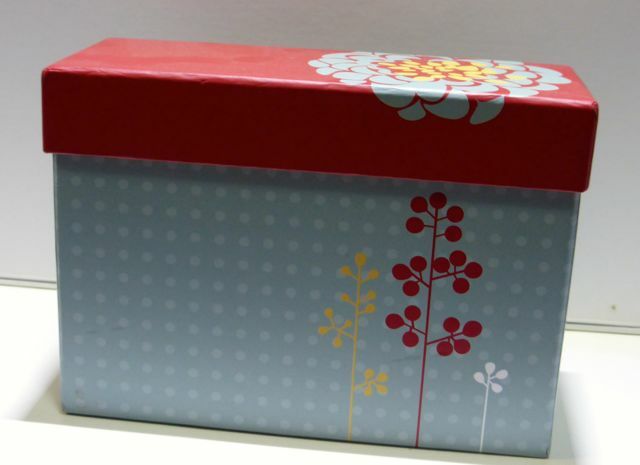 I used a Becky Higgins Design B page protector. The main reason I did it was that none of the photos I wanted to use on this spread worked with Design B, so I basically had an empty page in my album. I did this for the first time last night. Looks fantastic! The first time I enlarged a photo to fill one full page protector for my Project Life album was in 2012 and I was hooked! This is what I’ve found works best for me. I know there are many great tutorials online about how to go about breaking up an enlarged photo for Project Life. After trying several different ways, I’ve found this to be the easiest and the most cost effective for me. Step 1: Open your photo in your photo editing program. I’m using (a very old version of) Photoshop Elements. If you don’t have something similar you can download a free 30-day trial of the latest version of PSE here. 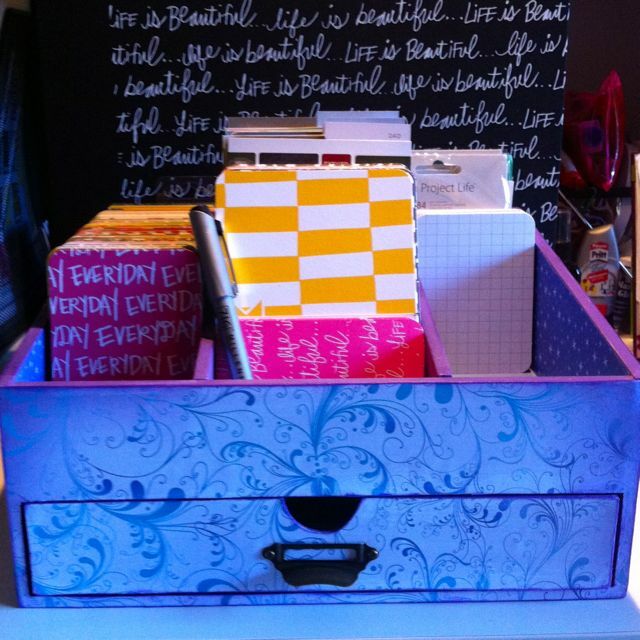 Someone asked me today whether I’d finished my scrapbooking organiser. You remember, the one that ended up covered in white paint . . .
Well yes. I’m pleased to say that the salvage operations were successful and I have a functional (not white) crafty organiser. 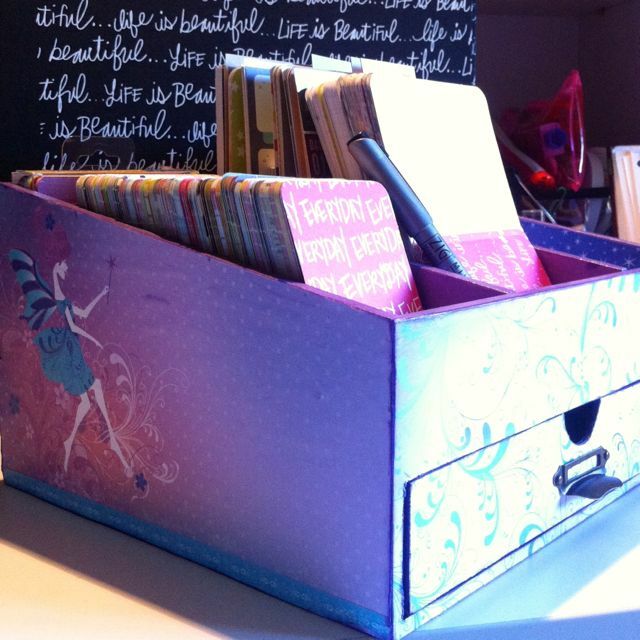 As you can see, it has lots of card-sized compartments. The outside ones hold 3×4 cards and the inner ones hold the 6×4 cards. I was surprised that the entire contents of my Project Life Sunshine kit fitted in a 3×4 compartment and a 6×4 compartment with still heaps of space to spare. 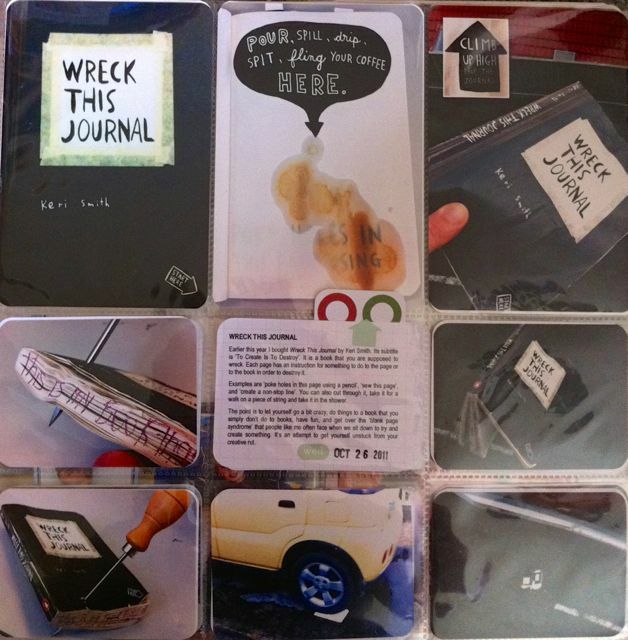 I’ve also put in the packs of Project Life theme cards that I recently got. What I did was cut down the cover sheet of the packs to 6×4, cut off the title of the pack to use as a tab, and make the cover sheet into a divider to keep the theme kits together in one place and organised. Pretty neat hey. 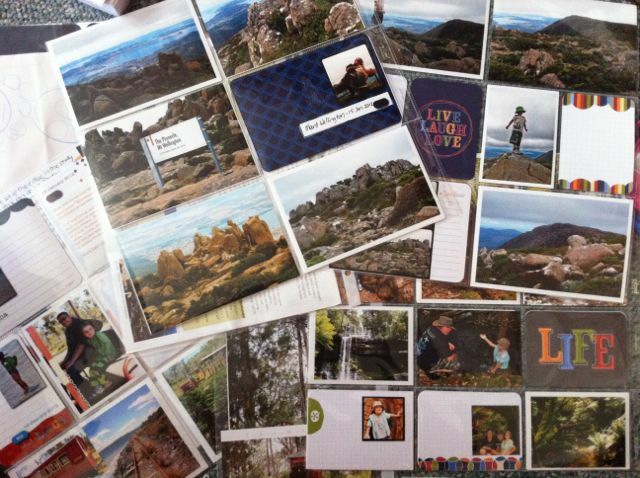 I’ve started getting my supplies together for my 2014 Project Life album at the same time as I’m finishing off my 2013 album. Last year my approach was digital/hybrid. This year I’m going back to a more paper-based album, but I’ll be sticking with the monthly approach that I’ve used over recent years, as well as (maybe) keeping photos on the same theme together. It’s a vague plan for now, so I’ll see how it goes. I’ve never really tried a chronological weekly approach. I don’t think it would work for me. Now that I’m putting the finishing touches to my 2013 album (I finished the cover layout last night) I wanted to post some photos of what it looks like. First up, the cover. I’ve been working on this over the whole year and changed it as I went along. 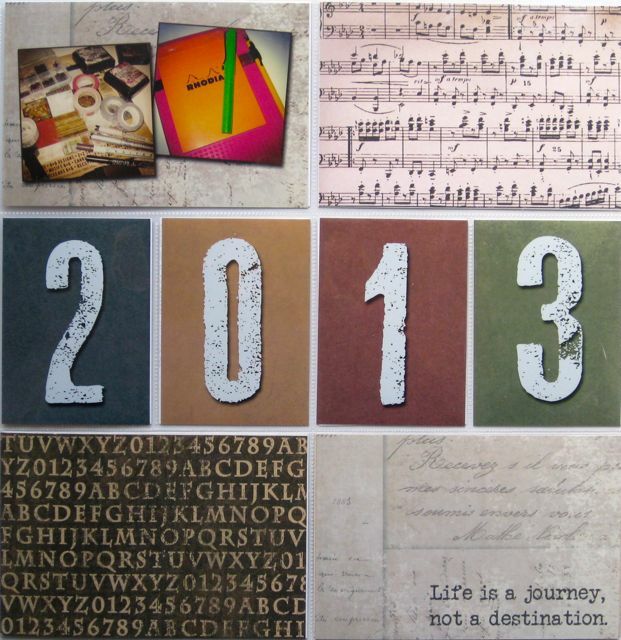 The idea was to fill the pages with quotes and things that spoke to me during the year. 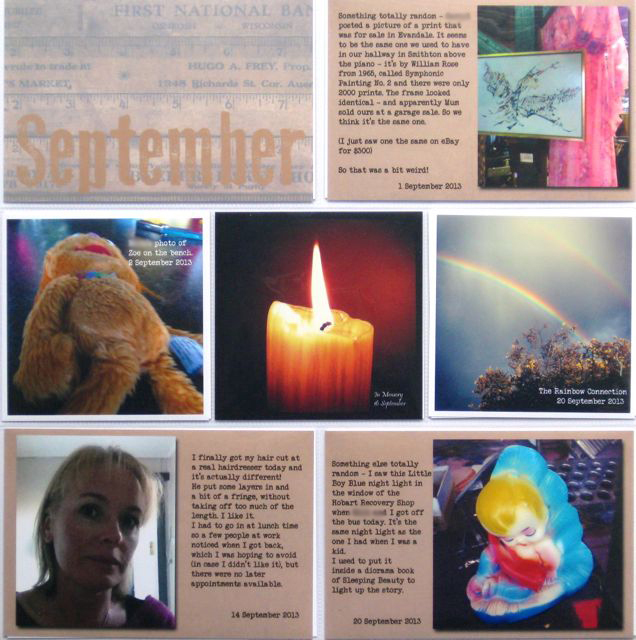 Each month has its own title page, followed by a few pages of random photos and journalling from the month, as well as layouts that cover a specific event or theme (somewhere we’ve visited, Juniordwarf’s school stuff, a major event, whatever needs more than one or two photos). I’ve mainly been using Design A for the month title pages. But I also like this design from We R Memory Keepers. The main design I’ve been using has been Design A. 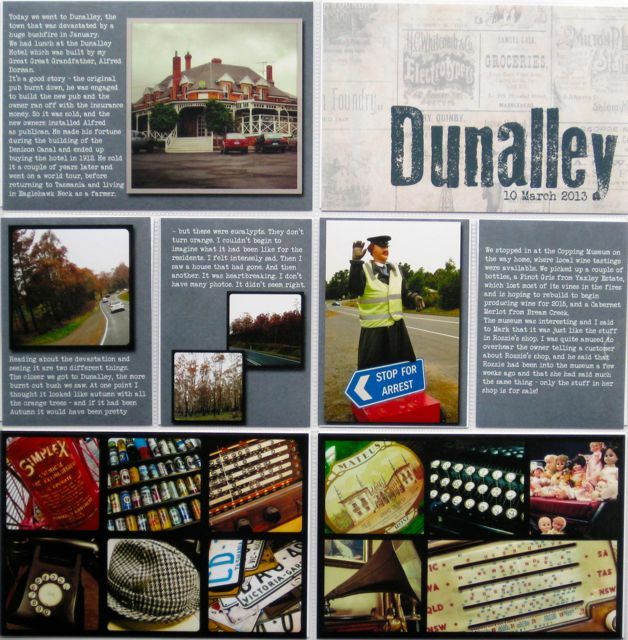 This layout is from our trip to Dunalley in March. Sometimes I’ll use different designs, depending on how many photos I have, and what the orientation of most of them is. Design D.
I love Design C, which is six 6×4 landscape photos. 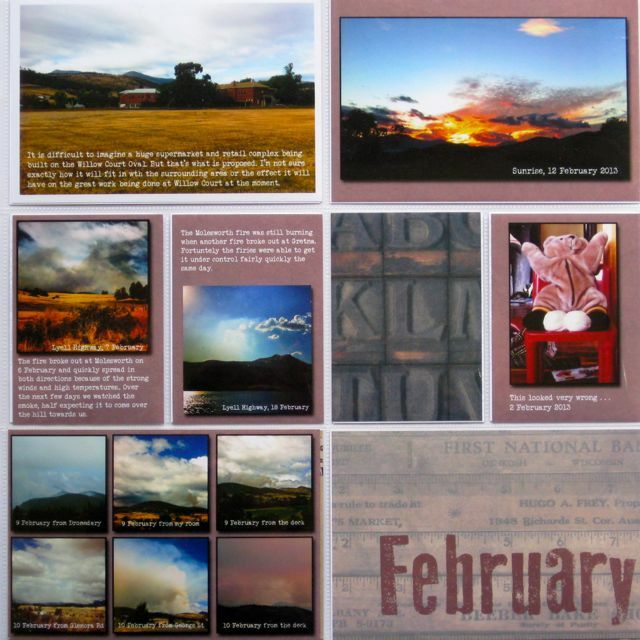 This is part of a double spread that also uses another page by We R Memory Keepers that has three 6×4 landscape photo slots and a 6×12 slot. Perfect for adding in over-sized visitor guides. And I can fit in even more photos in by using a photo collage app like PicFrame. 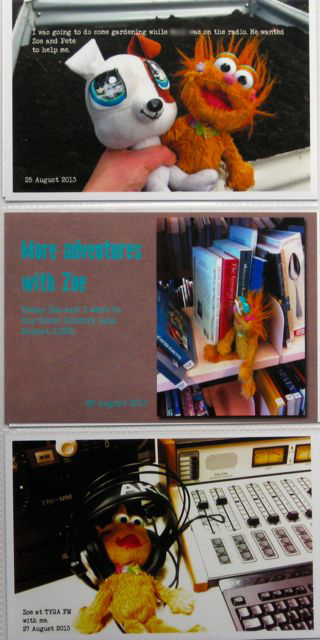 And on the other side, the opportunity to make s 6×12 scrapbook layout to go with three 6×4 photos. One of the other new designs I’ve been using quite a bit of is this half page design by American Crafts. It’s perfect for times when I don’t need a full page, but want to keep the photos separate instead of combining them with unrelated photos on a 12×12 layout. 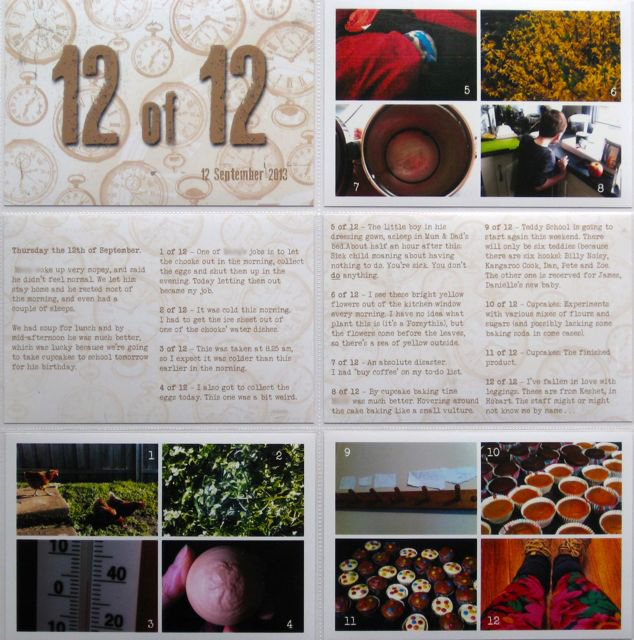 I’ve been incorporating my 12 of 12 photos and journalling into my album as well. I’ve been using PicFrame to create the collages. Design A, Design C and the We R Memory Keepers square design all work well. The one I choose will depend on what’s going on the other side of the layout. The other thing I’ve been doing – well I only recently discovered it – is to use the Collect app to create 3×4 cards that can slot into the 3×4 vertical slots with no extra work required. For November I ran these cards throughout almost every page. 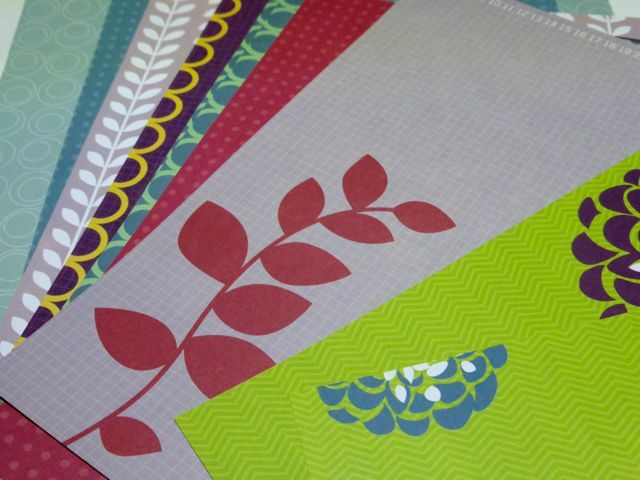 I think these would work well on a page with lots of 3×4 pockets, like Design F (which I used in 2012 and you can see in this post) or Design U, which is entirely 3×4 pockets. So that was 2013. All I have left is the remaining photos from December and some from September, and a few scrapbook layouts, which I will just include in the relevant month. 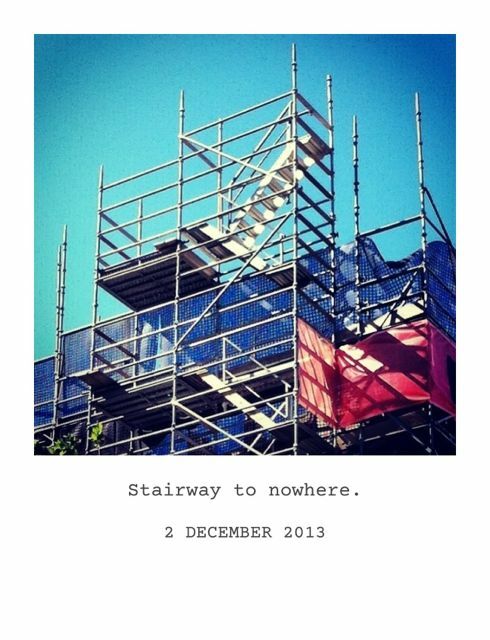 Then I can really get stuck into 2014.